As a knowledge vector, the Internet is peerless. You can inject data into people’s brains whether they want it or not. So I knew from the start that I was going to learn things once I started floating around in the ol’ intertubes. But I really thought I’d already had a pretty firm handle on what could and could not be funny. As usual, I have been proven wrong. Read on for a list of five things I never thought that I would laugh at… in no particular order. Initially I was going to say “Animals with Speech impediments”, but as the Looney Tunes have made thoroughly clear, mush-mouthed creatures have always been hilarious. Lolcats, loldogs, and their various offspring have taught me that slapping a caption on the most innocuous picture of a dog yawning can make me… well, laugh out loud. Also, I like seeing cats engaging with invisible props. What can I say, I’m a simple man. The subject of ground-dwelling rodents and their melodramatic potential had, astoundingly, never crossed my mind until the fateful day that the dramatic chipmunk made his appearance. The sheer intensity of his gaze more than made up for the fact that he appears to be a prairie dog, not a chipmunk. Perhaps it is the misidentification that has caused him such emotional anguish? Since then his title as the most skilled woodland thespian has been challenged, but no one will ever take away his distinction as the first. To me, when it comes to the top actors that are frequently confused with a different species, he ranks right up there with Paul Giamatti. Prior to the Internet, my classifications were as follows: zombies are scary, robots and ninjas are awesome, and pirates are cool. If I were asked to combine them, I probably would have imagined that robot ninjas would be super awesome and that is about it. Now I know that Pirates and Ninjas are mortal enemies, and everything is better with zombies. Yes, everything. Driving, gardening, dancing, you name it. Strangely, robots, despite being objects of technology and thus most like the Internet themselves, seem to have fallen out of favor. Unless, of course, we are talking about a robot zombie, or a robot pirate. Or possibly a robot zombie pirate ninja. Conan O’Brien, in his “Late Night with” incarnation, had already illustrated the vast comedic potential of the bearded roundhouse kicking machine. Scenes of his magnum opus, Walker Texas Ranger, when taken as discrete and context-free entertainment events, are pure gold. Trivia about him, on the other hand, I would have expected to be the usual bland tallies of kids and wives and martial arts accolades. Imagine my glee when I discovered that his beard conceals another fist! And that he does not sleep, he waits. Who knew learning could be so fun? If you’d asked me a few years ago if I would ever laugh at a pre-teen who was drugged, I would probably have said “Of course not!” and then quietly sought out a phone to alert the authorities. Then came “David after the dentist”, and THIS little post. Now I say, bring on the stoned toddlers! (Videos, please. 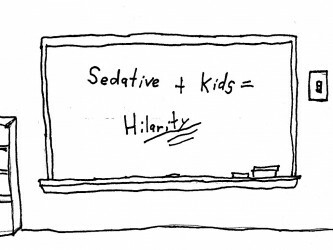 I don’t actually want half sedated children brought to me. The cops keep a close enough eye on me as it is. And only when sedated for legitimate medical reasons… you know what? Forget I said it.) I think what makes it so funny to me is that, when a man gets high, it is usually his idea. “I’m going to take this pill, it is going to make the sky talk to me, and it is going to be awesome.” Meanwhile, a kid ends up stoned because of dental surgery or some similar major event. This little guy has only JUST come to grips with the way the world works, and now the universe is a dizzy vortex of confusion. It has got to be like when they first invented LSD and they were testing it on CIA agents. Anything that draws parallels between CIA agents and toddlers if fine by me.